Baked Peaches Perfect for Putting in Top of Anything! Top toast, put in oatmeal, or eat with a side of cottage cheese. The possibilities are endless with these baked peaches. This is so easy. Simply cook these on the stove top for a couple minutes so they start to soften and absorb your seasonings. Place on a baking sheet and voila, you’ve got a delicious yogurt, oatmeal, or ice cream topper. Have baked peaches for breakfast in the morning. Use them as the “syrup” for your pancakes with a side of yogurt. YUM! Love baked fruit? Check out my recipe for baked pears. Baked peaches are so simple. They really liven up anything from yogurt to cottage cheese to oatmeal. 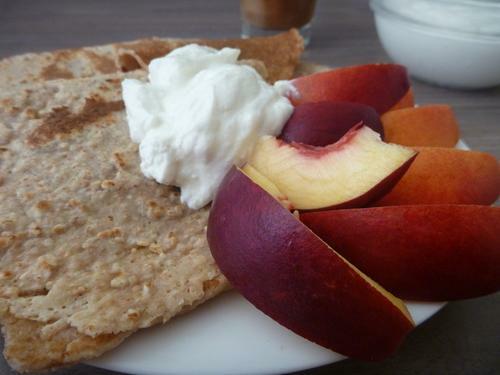 You can even use your overripe peaches for this! Cut up the peaches into inch thick, horizontal pieces. Heat a large skillet over medium-high heat. 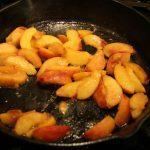 Place the seasoned peaches into the pan and cook for 5 minutes, so all the oil and seasonings get absorbed. Line your baking sheet with foil. Place the peaches about an inch apart and on on layer so they cook evenly. Baked for 20 minutes. When they are easily pierced with a knife, they're ready!